Go to Convoy Street: I’m not sure how, but I just never knew where or what exactly Convoy was until recently. I had always thought it was an actual store, so I never could find it online. The worst part of this is that I have ordered takeout from several places on Convoy but never realized that’s where many UC San Diego students spend the weekend! As such, I need to actually go next time I’m free and have a late night craving for some Chinese food. Go to Black’s Beach: Part of the reason I have never been is due to my reservations about going to a nudist beach. While I respect people who are confident enough to go commando, I don’t think I’ll ever be comfortable letting everything hang loose myself. This is one of those trips that definitely will put me out of my comfort zone but I will have a great story to tell afterward. Learn to dance … normally: Those of you who know me in person know that I am 5 feet 10 inches of pure awkwardness. Naturally, anything that involves coordination, more specifically dancing, is not something I actively seek out. I’ve always thought it would be fun to learn, so one of these day I will gather enough courage to go to one of those “Salsa On The Beach” events. Visit all the pieces in the Stuart Collection: After the mysterious appearance of the blinking light in Roger Revelle College, I realized I haven’t seen a lot of the cool art around campus. While I have seen some of the pieces, including the ones that have been removed (rest in peace, Big Red Chair), I have yet to venture to other parts of campus, including the Warren Bear and the Wind Garden. I have also never been inside the Fallen Star, so I have to go and take aesthetic photos for Instagram. Do Coffee-With-a-Prof: I always forget about this program, so by the time I remember to get the voucher, they are almost always all gone. I feel like I missed out on making so many connections with professors because I was always too shy or nervous to talk to them in a more casual setting. This year, I plan to be more confident and already have so many professors in mind. I can’t wait to get to know them better and build lasting connections. Stay until the end of Sun God Festival: Last year, I went to Sun God, grabbed as much free stuff as possible, and went home. While I technically had the Sun God experience, I want to actually stay for the music and visit both stages. Hopefully the line-up this year is enticing enough for me to stay. 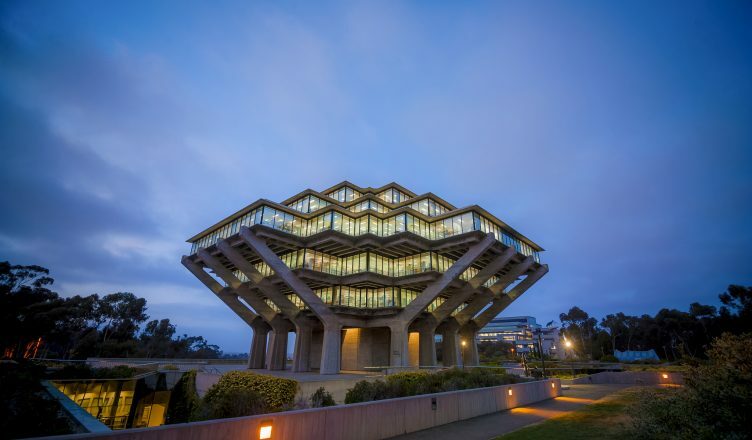 Pull an all-nighter in Geisel Library: While I have pulled all-nighters before, I usually try to avoid Geisel like the plague. Every time I walk into the second floor, I can feel the sadness and suffering of my fellow Tritons and get second-hand anxiety. However, I hear of the wonderfully delirious things that happen in Geisel after hours, including people rolling on the floor in onesies and spontaneous screaming. Clearly, I am missing out, and I plan to head to the second floor before my next midterm. I can’t promise that I’ll do everything on this little bucket list because I tend to be hesitant about trying new things. But I can assure you that I will be putting myself out there more often. Living off campus has given me a new perspective on college, as there is more to life than constantly studying for midterms. The renewed sense of freedom is allowing me to be more open-minded and a little less “UC Socially Dead”.